As always for Holiday greetings, I use photos I shot myself, and this one I like a lot. 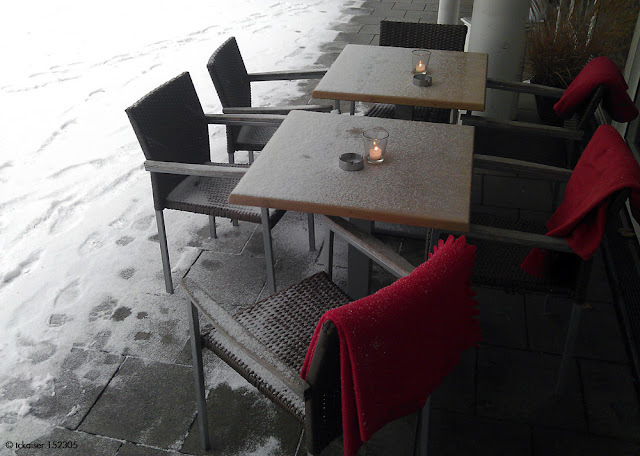 I took it with an HTC Sensation mobile in December 2012 on the terrace of the (sadly now defunct) Graf's Bistro in Starnberg/Bavaria. And believe it: quite a few people do sit outside even in winter, wrapped in blankets and enjoying a latte or a hot cocoa. Delicious. To a delicious Christmas and to a Blessed New Year! There's an assumption that anyone selling over the holidays, and thereby taking time away from family get-togethers and Christmas shopping and is selling because they have to, not because they want to. That assumption tends to be true. And it can payoff for buyers. "Sellers tend to avoid the end of the year due to the short days, wintry weather and conventional wisdom that says buyers are otherwise occupied, says Tim Deihl, associate broker at Gibson Sotheby's International Realty in Boston," said Bankrate. "But those who do choose to sell at year-end are often under pressure and highly motivated to cut a deal. And that's why the year-end might be a smart time to buy: Determined house-hunters can take advantage of sellers' urgency." Experts say that homes listed over the holidays may have a lower sales price. If you're looking for a deal, braving weather conditions and skipping out during a football game to see a listing might make sense. "Less competition from other buyers during the holiday season might mean you'll be able to negotiate a favorable price for a home you want to purchase," said Bankrate. Added CBS News: "Holiday home sellers often have to adjust their price downward or make other concessions if they want to sell. Keep this in mind as you search for homes. Bargains may be available, and listed prices may be more open to negotiation." "Generally, all parties involved have incentive to complete transactions toward the end of the year," said CBS News. "Lenders want to close their books, real estate agents want to receive their commissions before the year closes, sellers want to move on to their new home and settle in for the holidays—and just like the sellers, you want to settle in as well. Since all parties are motivated and there are fewer transactions taking place during this time, it should be easier to put everything in place for a smooth and rapid closing." If you're not able to close before the end of the year, rest assured that the real estate market doesn't spring to life as soon as January hits. You should be able to have a clear path to homeownership for a few months before the spring thaw hits and the hot buying season begins. If you're selling an existing home and walking away with money, you'll have more to spend on others—especially if you factor in the delayed first house payment on your new place. Nothing is worse than packing, moving, unpacking, painting, breaking down 700 boxes, and making 12 dozen trips to the trash in unbearable heat. And when you're working that hard, anything over 80 degrees can be unbearable!